Ich habe als Motiv eine meiner neuen Tildas verwendet und sie mit Supracolorstiften und Spica Glitter Stiften coloriert. Danke fürs Anschaun! I finally managed to do a card for the first ismaki challenge, a new challenge blog, based on sketches. 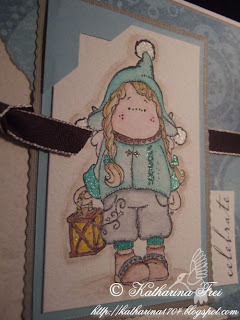 I used one of my new Tildas, couloured her with my Supracolors and highlighted some details with Spica glitter pens. très jolie cette carte, surtout les petites choses qui brillent! Deine Karte gefällt mir wirklich gut. Tolle Farben!! She is super cute! and your colouring is fantastic! Wonderful! Stunning! what more can I say. This is a lovely card! You do a great job with the coloring. I find in really neat that you are originaly from Vienna, I have a cousin who lives there. Love your blog and your work! da ist ja wieder so ein schnuckeliges Kärtchen von Dir... einfach süß!!! OOhh Katharina, another Beauty! Adore the colours and that Tilda is one of my Favs! and thanks also for the lovely comments you left on my blog!! Ich bin mal wieder von den Socken. Einfach zu schöön. Wow! Die sieht absolut klasse aus! Richtig toll! Deine Karte gefällt mir richtig gut, tolle Farbwahl.